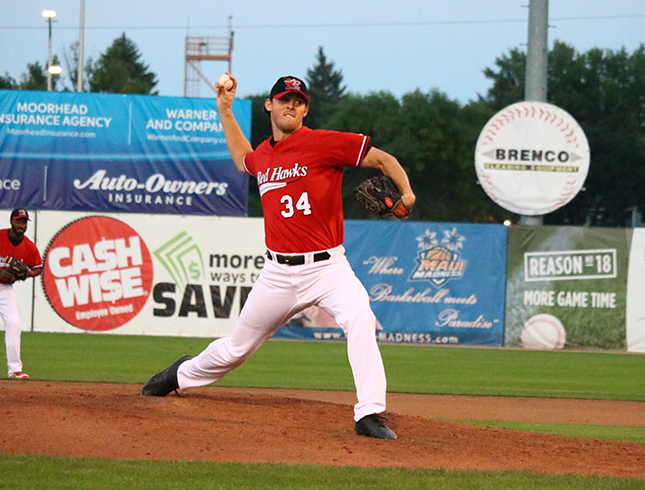 09/01/2018 8:54 PM - FARGO, N.D.  Five runs in the fifth inning and another four in the sixth catapulted the RedHawks past the Sioux Falls Canaries for a 9-2 win Saturday night at Newman Outdoor Field. Devan Aharts three-run homer in the fifth was the difference as Brandon Barker held the Canaries to just two runs over his seven innings on the mound. Both starting pitchers  Barker and Sioux Falls Dylan Thompson  were outstanding until the fifth, when Thompson gave up two earned runs before an error by the Canaries third baseman extended the inning and brought Ahart to the plate. Aharts 11th homer of the season gave the home team a lead it would add on to in the sixth. A two-run triple from Yhoxian Medina made it a seven-run game before Derrick Fox doubled home the shortstop and came around to score himself on another error by the Sioux Falls third baseman. All in all, Fargo-Moorhead scored four runs in the sixth to extend the lead to nine runs with three innings to go. A two-run home run for Sioux Falls Jordan Smith spoiled Barkers shutout bid, but the right-hander finished the game with just two runs against on six hits over seven innings. Barker rang up six Canaries in the process for his third win of the season. Geoff Broussard and Randy McCurry each pitched perfect innings in relief to finish off the visitors and help the RedHawks earn their 50th win of the season. Fargo-Moorhead and Sioux Falls will meet in Game 2 of their three-game series Sunday afternoon at 1 P.M. before finishing the 2018 season with a Labor Day finale at 1 P.M. on Monday afternoon.